You can use a value converter anywhere in XAML where you are using data binding. Below is an example of using a value converter within a data template. The Visibility property is bound to the underlying Actor object that is the data context for the item template. The value converter then derives a value for Visibility from several properties within the Actor object. (Assume that we have an ActorList property that is a collection of Actor instances). 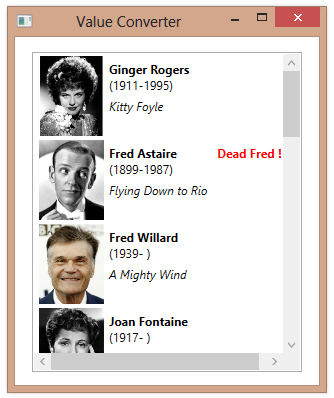 <Label Content="Dead Fred !" Foreground="Red"
Good point, thanks Thomas. DoNothing value may also be appropriate.